"The future and health of any organization -- military or civilian -- depend on effective leadership at all levels. In this book, Randall Ponder provides an imaginative and eminently digestible road map of leadership principles and techniques of leader development that will be of great value to experienced leaders and novices alike." "In Leadership Made Easy, Randall Ponder captures and conveys the behaviors needed to establish a culture of leadership and drive individual and organizational performance to new heights." --Dr. Henry McKinnell Jr., former Chairman and CEO of Pfizer Inc.
"The topic of leadership has been discussed and debated for years, and many books are available to introduce you to this vital subject. However, Leadership Made Easy goes beyond the basics to explore the areas that all great leaders must understand and implement to be successful. The overriding point of this guide is that leadership can be learned. All one needs to do is practice the fail-safe strategies outlined by Randall Ponder." "Over the past few years I have had an interest in learning as much as I can about leadership in a small business setting. As a result, I have read quite a number of business books that discuss the topic. None of the usual shortcomings appeared when I read this book. How refreshing! In this book, the author explains leadership so the reader can easily understand it. Leadership is a highly complex subject, and the author has done a great job in this book's 236 pages. 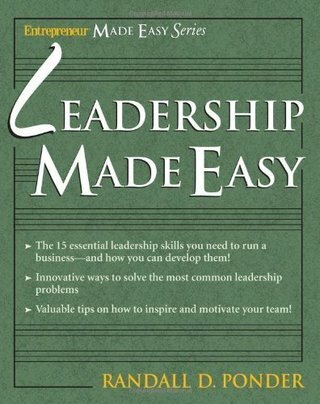 Don't skip reading this book if you are interested in learning about what is involved in being a good leader." Leadership is the ability to get the right things accomplished at the right time with the assistance of other people. Several words in this definition will be explained as you proceed through this book. How do you get this ability? How do you determine the right things and when are they considered accomplished? Finally, who are the people that will help you and how do you get them to assist you? Leaders are ordinary people who usually have an official position of responsibility. Organizations, subordinates, superiors, and peers depend upon leaders to do the best job that they can. Since so many people rely upon them, leaders have an obligation to do everything within their power to do their job well. An exciting aspect of leadership is that anyone who chooses to can become a leader, including individuals at all levels of an organization. There has been much debate over the years as to whether people are born as leaders or if they can be developed into leaders through experiences and education. The consensus is that a willing person can learn specific skills and knowledge and emerge as a leader or a better leader than they are now. You can become a leader whether you are shy or extroverted, educated or not, organized or disorganized, charismatic or dull. The only requirements are a desire to become a leader and a willingness to develop the skills. © 2011-2016 by Randall D. Ponder. All Rights Reserved.